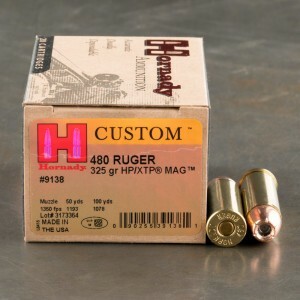 The good folks at Hornady developed .480 Ruger ammunition as a rimmed, straight walled, .475 caliber, revolver cartridge. The round was introduced in 2003 by Strum Ruger specifically for the purpose of hunting large, dangerous, game species with a handgun. But, rather than chambering their popular single action Blackhawk for the new round, Ruger instead chose to chamber their Super Redhawk to accept the new round. Similar to the .475 Linebaugh “super cartridge”, .480 Ruger ammo is often referred to as a .475 Linebaugh Special due to the fact that the .480 Ruger cartridge can be safely loaded and fired in revolvers chambered for the .475 Linebaugh. However, .480 Ruger was specifically designed to work at lower chamber pressures than either the .475 Linebaugh or the .454 Casull while the .475 inch muzzle diameter allows for the use of bullets weighing over 400 grains; thus creating a large caliber handgun hunting cartridge with extreme terminal ballistics that generates less felt recoil and muzzle flash than either of its more powerful cousins. The standard factory load for this cartridge pushes a 325 grain bullet from the muzzle at approximately 1,350 feet per second which provides 1,315 foot pounds of muzzle energy and yet, at 100 yards, it is still moving at 1075 feet per second and carrying 810 foot pounds of energy with a mid-range muzzle rise of only three inches. Consequently, the .480 Ruger is an excellent choice for handgun hunters who are looking for a cartridge that is capable of taking down the largest of North American game species but would prefer to avoid the excessive recoil and muzzle flash of the more powerful “super cartridges”.